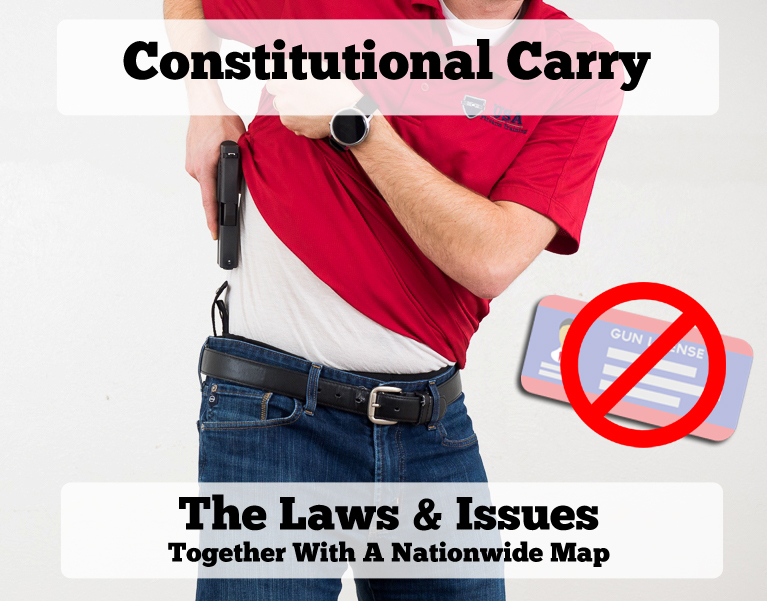 The term Constitutional Carry or Permitless Carry refers to legislation, generally at the state level, that allows anyone who can legally possess a firearm to carry it concealed on or about their person without any requirement that the gun owner obtain a license or permit. What States Currently Have Constitutional Carry Laws? The below map is indicative of the states that currently allows citizens to carry concealed firearms in any or all situations without first obtaining a concealed carry permit. Vermont is unique on this map since (as of this writing) they are the only state who has no concealed carry permit at all. The other Constitutional Carry states (shown in Green) do have permits that are available for those who want additional flexibility beyond what the permitless carry law allows for. *NOTE: Some states reflected above may have restrictions like only allowing constitutional carry for residents or something similar. Do your research and consult with an attorney! What Are The Core Arguments in Favor of Constitutional Carry? The core argument in favor of Permitless Carry is simply that the ability to own a firearm and use it in self-defense is protected by the second amendment of the US constitution. As part of our Bill of Rights the majority of gun owners feel strongly (and I count myself as among this group) that no license should be required by the government in order to exercise one's right to keep and bear arms and that right includes carrying a firearm concealed. Furthermore, we have now many years of experience with states and constitutional carry. Nothing has happened that would suggest or indicate that allowing citizens to carry concealed even without a permit or training, has a negative outcome on public safety. This “track record” is the greatest supporting data in more constitutional carry legislation. Concealed is key here because it is in the best interest for a gun owner to not parade the fact that they have a firearm and are prepared to defend themselves. Doing so often makes the gun owner a target and eliminates the significant advantage that surprise brings in an encounter. Further, there is some concern that a concealed carry permit system, even when sustained and managed by a State or County government is still ultimately a database of gun owners that could potentially be seized or leveraged for bad if the political game changes significantly in the future. Having the right to carry concealed without a permit is also the right to avoid “being on the grid” in order to exercise one's rights. What Dangers Exist with Constitutional Carry? While as a community of gun owners we largely support constitutional carry legislation we also work hard to communicate the potential concerns and dangers for citizens that live in states with these laws and who choose not to obtain a concealed carry permit. 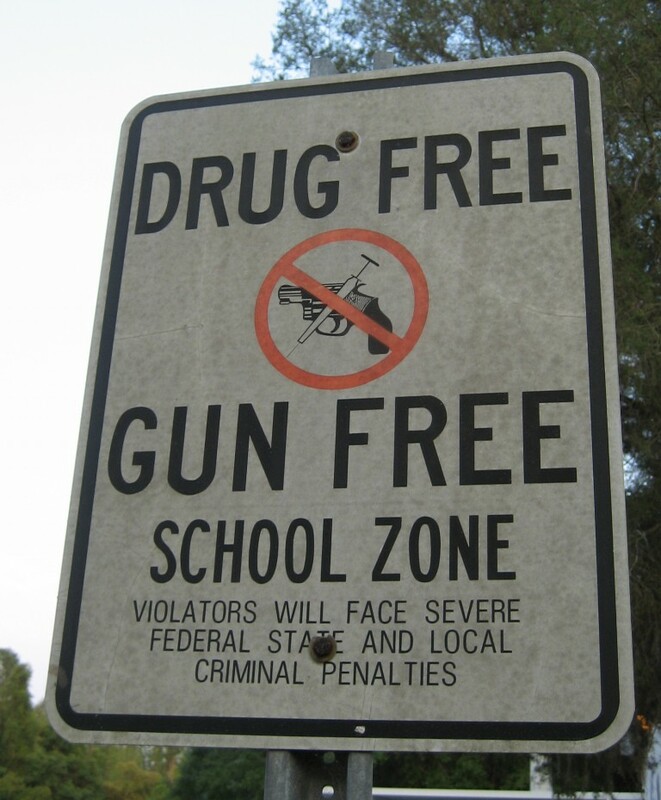 One core concern that is not well known is that of the Gun Free School Zone Act. This is a piece of Federal legislation that universally across America makes it illegal to posses a firearm within 1000 feet of a school (with the exception of private property) without being otherwise “licensed” by the State. So, without a permit, EVEN in a state with Constitutional Carry laws, one cannot be within 1000 feet of a school. This creates a significant restriction since schools are EVERYWHERE and during the course of an average person's daily commute one might drive through the 1000 foot zone on several occasions. Unless that Federal law were to be changed or amended gun owners who can otherwise carry concealed without a permit per their state laws are wise to get a permit anyway. 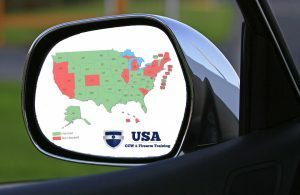 My own sense from the instructors on our team (now more than 30 in 17 states) is that citizens who live in states where they can carry concealed without a permit tend to get into trouble because the Constitutional Carry Law tends to create a mental safety blanket that creates a sense of “everything is legal,” when in fact there are always restrictions. 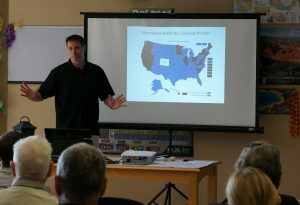 Most gun owners learn about their state laws in a basic concealed carry class. If you live in a state where either no class is required to get a permit, or in which no permit is required to carry concealed you never obtain that kind of training or instruction. Even taking industry standard classes like the NRA Basic Pistol course or NRA Personal Protection Outside or Inside the Home will not provide the student with any instruction about their local state laws. Legal restrictions always exist. No matter how amiable the laws may seem there are always places you can't go, things you can't do, situations in which you are not justified, and other restrictions for which ignorance is not excuse in the court of law. One of the greatest concerns with the lifestyle of permitless carry is the lack of reciprocity with other states. While the state in which one resides may allow the carrying of a firearm without a permit the crossing of a state line may put that same gun owner in violation of the law. Constitutional Carry is a form of law that for now is still uncommon. The vast majority of states still require a permit to carry concealed and thus in order to travel with one's firearm without significant legal burdens, one needs a concealed carry permit that is honored in the states where one travels. Also worth noting and warning members of our community that many states who do allow concealed carry without a permit reserve that right to their own residents. Don't assume when traveling to one of these states that you do not need a permit to carry concealed there as a non-resident. In addition to the concern of the gun owner not knowing the laws, the lack of any required class also puts the gun owner in a bad position if they don't seek out any training on their own. Firearm related defense is far more than just the initiative to carry around a gun. You wouldn't give someone a toolbox and ask them to build a house without a little training and education would you? This is not an endorsement that training should be required by law, only a concern that in places where it is not required gun owners are often inclined not to pursue it and our community needs to learn how to address that with balance. We urge you to support Constitutional Carry legislation while balancing that with the understanding of how critical training and education are. Ignorance is no excuse and we all need to learn as much as we can and as appropriate encourage others to join us in that effort. What do you have to do to get a concealed carry permit or license? In the state of Georgia. Georgia doesn’t require any training although its a good idea. Apply at your local county sheriff’s office. Many counties have an online application via their website. you apply for the Carry Permit in GA at the County of residence PROBATE Court. you will have to visit the Sheriff’s Office ID Dept for Finger printing. Last I checked, Fee of 65 bucks now is due at time of application. I agree training should be done for people that want to carry a weapon in public. I have a permit to carry in Indiana. As far as reciprocal goes, I carry in whatever state I travel in. Thugs and criminals carry in every state and so do I. Telling me that I can’t carry in your state but yet the criminals can, doesn’t fit with me. I’ll carry wherever. The only thing that stops a bad guy with a gun is a good guy with a gun. P.S. If a felon is allowed to run for the democratic presidential nomination, I can carry in any state I want. And so it shall be. Good post George; I concur 100%! I do as well. My number one complaint is “GUN FREE ZONES”. This is an open invitation for an active shooter, intent to do the most harm while meeting no resistance, to COME ON IN! There are enough qualified and trained parents, that I dare say there would be a lot of volunteers, to go to the schools and blend in with the other teachers or workers. I am retired from the Dept. of Criminal Justice Service. Unfortunately I had a stroke a few months ago which prohibits me from volunteering, or I would be glad to donate my time. I agree with your comment 100% and I don’t leave my house without mine. Actually, the Felons husband was a Felon, and became President. He was Pardoned by Jimmy Carter. But that did not make him legal to run. The corrupt Congress sat back and allowed it. Sounds like I wrote your answer. I agree with George it’s my constitutional right to bear arms, to protect myself, to protect my family, protect my country from all foreign invaders! And now we have more women with permits than ever before to protect herself and the children when the man’s not with her! YOU GO GIRLS!!! This map is not accurate, as some states have recently passed Constitutional Carry. I live in Maine; we became a Constitutional Carry state several months ago. Thanks James. I’m updating it now. Thanks Jacob; I’m sure you are aware that the state of Idaho, as well as another state or two, are on the verge of passing it as well. I personally have not much of a problem with the permit system, but we all know that the reality is thta it won’t stop bad and dangerous thugs, gangs, drug dealers, or terrorists, form getting or carrying guns. It only works on law abiding ciiizens. I do not like the fact that my permit is not honored nationwide; it should be like a driver’s license, and be honored in every state, period. Would love to chat with you some time. I obtained my concealed carry here in Colorado. The training class I attended for my carry was absolutely worthless. I see a lot of them out there that are just as bad. I did find another, much better for a friend of mine. However, I would be interested in helping with the training aspect of concealed carry. Sorry to hear your class was soo poor. Its the nature of the system for sure… with so much variety in styles and skills. Currently in Colorado we have 8 instructors including myself. Not opposed to chatting but admittedly we aren’t looking for more instructors on our team currently. I grew up in the Northwest area of Colorado. I find it silly that Co only has 8 Instructors. There should be one in each county at a minimum. 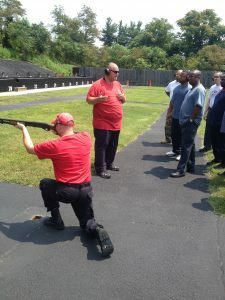 Now those of us that grew up on the mountain knew firearm safety by age 10 to 15 so no issue there, but any City should have an place and an Instructor to train for both safety and accuracy. I also find the recent laws passed in Colorado to be a horrendous change of the situation. WHAT HAPPENED TO COMMON SENSE??? Born in Rifle, Co. and Grew up in Meeker. Worked as a Guide for Hunting in my teens. Russell I’m sure there are hundreds if not over a thousand instructors in Colorado. On our website you might have found only 8 listed because those are the instructors who work on our team and with our company but we have plenty of competition. Oklahoma is now also a Constitutional Carry state starting in Nov. 2019. Oklahoma now has constitutional carry. There was a time (in the 70’s) when we could wear our revolvers on our hips when riding our cycles. A writer for ROAD RIDER magazine met with me and a buddy of mine when we were riding with our wives on the Tahlahina Drive at a rest strop. He wrote an article, and took pictures …then he asked us to let him take picture WITHOUT the guns, because he thought ROAD RIDER magazine might not print the pictures with our guns ON… ROAD RIDER magazine PRINTED the article, and pictures WITh the guns ON!!!! I am proud of the coverage, and for ROAD RIDER mag for having the…guts to show resonable carry bY reasonable people.Thank you ROAD RIDER mag. Thanks George. I had not included Oklahoma originally because it only applies to residents of Oklahoma or other states that allow constitutional carry. I just updated it to include Oklahoma and included a broad disclaimer below the map. Oklahoma DOES NOT have constitutional carry. Governor Fallin vetoed (11 May 2018) the latest attempt by the House and Senate to make that happen. I’ve taught the Oklahoma Concealed Carry classes for the last 12 years. Oklahoma does allow for both concealed and open carry, provided one has the concealed carry permit. Semper Fi. OUT!!!!! Sorry George, Don is right where the good citizens of Oklahoma are concerned. After promising at least twice that I know of to sign a constitutional carry bill if it got to her desk, Gov Fallin vetoed it. I spent several days at the capital helping to get it through both houses; it was like a slap in the face to me. But Oklahoma can be considered a ‘partial’ constitutional carry state. If you reside in another state that has constitutional carry you can carry without a permit in Oklahoma, by just showing your govt issued photo ID proving you live in that state. Plus if you’re a member of the military, to include Nnational Guard, your military ID is your permit. But unless you’re an Oklahoman serving in the military in Oklahoma, all other Oklahomans are SOL. We need a permit to carry, open or concealed. While I read about people that took an oath to protect and defend the CONSTITUTION, and then work hard to destroy it, I am truly happy to read about American heroes that ARE working hard to protect our CONSTITUTIONAL Rights by getting legislation passed such as CONSTITUTIONAL CARRY! Here in the great state of LOUISIANA we have open carry without permits, but a permit is still required to carry concealed. Hopefully some of our elected officials are true American Heroes and will work on passing CONSTITUTIONAL CARRY in our Great State! I live in the liberal state of Maryland and I do have my conceal permit, although it took me almost 5 months to receive it. I do travel in Delaware and Virginia but still not sure why I can’t carry concealed in either state, if I’m wrong I can’t seem to find the correct place that tells me if I can? I LIVE IN FLORIDA. WHAT, IF ANYTHING DO I HAVE TO DO TO GET A CONSTITUTIONAL CARRY LICENCE FROM OKLAHOMA? Jimmy, Oklahoma specifically only allows constitutional carry for residents of states who have constitutional carry. If you live in FL you need a FL permit to carry concealed in Oklahoma. This map indicates that you do not require a permit to carry concealed in Arkansas. That is incorrect. I just got my concealed carry permit last month. The TN Constitutional Carry bill is dead. Killed by greedy weasley politicians (That means you Sen. Todd “voting present not voting” Gardenhire (R-TN) ) who think its more important to “collect up all the fees” ( https://www.youtube.com/watch?v=LO2eh6f5Go0 ) than advance freedom and liberty. Constitutional rights cannot be licensed or taxed. That is why, as a voting constituent and member of Gun Owners of America, I am asking you to support and vote for SB 1483 and HB 1748, Constitutional Carry for Tennessee. Constitutional Carry simply means anyone legally allowed to carry a firearm does not need to register with the state, seek permission slips or pay taxes on a constitutional right. It not only restores our rights, it makes our state safer. I, and other Gun Owners of America members, will be watching your vote. I’ll be glad when we get constitutional carry here in Texas. Some cities and counties in TX do have permitless concealed carry. You can look that up online. Texas needs to get CC passed in the next legislative session. It just don’t make sense to be required to have a license to exercise a constitutional right. I assumed if my state had constitutional carry and left, I may get hit if I leave the state, there’s plenty of articles warning about that. I, however, have not seen many commenting in blogs or articles…If I go to a constitutional carry state and my states permit was previously not accepted in such state can I now carry? I assume it’s different state to state, but does the constitutional carry generally cover non residents? Dan, you are correct. It is different from state to state but generally states with constitutional carry do extend that right to visiting non-residents. Its worth researching on a state by state basis. Why should it be illegal? Because if you lose that piece of plastic then whoever finds it has your home address and if your keys happened to be with the license then they have those, and if it’s a CC license then they know it’s likely there are guns in that home putting the community at risk. Also, providing that unnecessary data would make it easier for identity thieves to hack your identity. This personal data should only be viewable by law enforcement on their computers; and if their computers are like the rest of the government’s computers are probably easily hacked. Is it legal to open carry , and or conceal carry without a permit in the state of Mississippi? If you look at your map, you will see ME, NH, and VT isolated from the rest of the country by NY. How will this work for national reciprocity? If you are isolated in northern New England, how does one get to OH or any other state. Will NY have to allow passage of Permit Holders from New England? If the National Reciprocity act passes and becomes law then yes NY will have to allow/honor all permits from all states. In the current climate if you travel through a state that doesn’t honor your permit you can still bring your gun but you just have to be compliant with article 926a of the Firearm Owner Protection Act. Other than NICS, which is in and of itself an INFRINGEMENT, what other federal restrictions / requirements exist, and why are states allowed to restrict an activity that is not restricted at the federal level? What ever happened to “Federal law trumps State law”? Being retired military, I can’t help but see a chain of command where POTUS outranks any Governor. When the Attica, NY prisoners rioted in the 70’s, who told who to get the mess cleaned up ASAP because of the negative publicity? That’s right, Pres. Nixon told Gov. Rockefeller, because Nixon ran on a platform of law and order. Now, another military idea, regulations published at different levels … A local commander can use his discretion to tighten a reg from Dept. of the Army, or some other level above him / her self (division, brigade), if he / she deems it necessary to the specific unit’s mission, but cannot allow what the higher levels prohibit. This, on the surface might seem to be an argument in favor of state and even county or municipal gun control, but my opinion is that the analogy is not valid, as POTUS, SCOTUS and Congress do not have the same type of control over the States and lower levels that the military enjoys from the flag officer ranks on down to the boots in the sand troops getting shot at. Arkansas is Now Confirmed a Permitless Carry State. Then on October 17, 2018, the Arkansas Court of Appeals made a ruling that pretty much cemented the fact that Arkansas is a Permitless Carry state. When I got my permit to carry I was told by law enforcement “if you are carrying correctly no one should see the gun” ” you only pull it when all else fails (talking) and start shooting when on target” “it is not TV or the movies” It is extremely serious. Being a Missouri resident where we have constitutional carry, if I travel to Tennessee, will Tennessee honor my constitutional carry from Missouri? We could serve our country and go to war but when we come home we may or may no be approved for a concealed permit. I have a concealed permit now but the legislation is looking at people with PTSD as a threat to society. Office workers get PTSD, police officers etc…. I just think this country wants to take all our guns. I agree that your address should not be on a concealed permit just the official that issued it and the state!